In the news, we have heard about China’s need to rebalance its economy, its slowdown in GDP growth, its debt buildup, and its government’s vague outline for economic reform. There is a great deal of uncertainty about where the world’s second largest economy will head in the near future. Where is the demand? Or, which buyers have the incomes and potential for repeat purchases of the product or input? 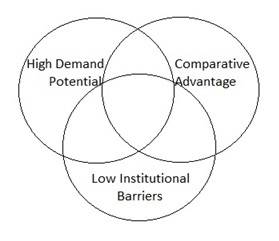 What are industries or niches with a global comparative advantage? What areas have the fewest institutional or regulatory barriers to growth? To answer the first question, we start by looking at where demand has been coming from, by component of GDP. Demand can come from households, firms, the government, or abroad, for production goods or consumer goods. If we measure demand components as a percentage of GDP, we can see that about half of it currently is in gross fixed capital formation, or investment. This includes land, infrastructure, and plant improvement. Households and the government consumption of goods and services comprise the other half of demand. 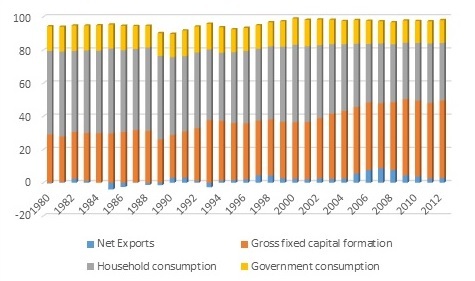 Net exports comprise a very small percentage of total demand. We can go through these larger components of demand one by one to consider future trends. First, we look at gross fixed capital formation. Analysts have asserted that the rising pattern of fixed asset investment is unsustainable, since there is now excess capacity in plants and vacant real estate projects, indicating that overinvestment is already taking place. Therefore we expect it to decline. Government and household consumption of goods and services may sustain itself—policy makers are keen on bringing about a rise in household consumption—but this is also dependent on the economic and employment outlook. Demand on the part of households may rise, but will certainly be unevenly spread across the country. This is because wages vary wildly by province. 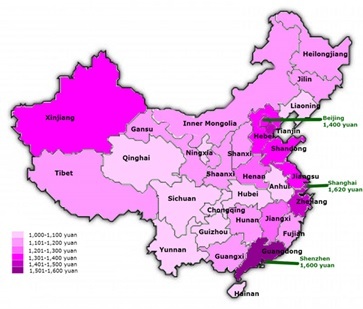 The figure below shows China’s minimum wage levels by region. What is more, despite a rise in the middle class, wages continue to be far lower than those in so-called developed nations. This means that while there is a potential for creating markets for higher value products, the market potential will greatly depend on the discretionary income enjoyed by households. For example, a household earning the highest minimum monthly wage at 1,600 RMB per month would be earning less than US$300 per month. Already, that is higher than the average monthly wage of 1,100 RMB. After subtracting out expenditures on food, clothing, shelter, and health care and education services, there is little left for high end consumer products. Economic expansion can result in an increase in household demand, but repeat purchases of goods or services would likely be concentrated in lower-end products for normal households, that is, on essential expenditures that households currently make. The government will likely continue to supply a relatively constant level of demand—no stimulus is expected per se, nor are large cuts in government spending. Firms will likely continue to invest in capital goods but not at the levels we have seen in recent years, and potentially in more productive types of investment, rather than in investment that has resulted in excess capacity. Consumer durables: As households have experienced increases in income over the years, many have purchased consumer durables such as color televisions and washing machines. Purchase of these goods is expected to increase as household consumption rises. Health care services: As the population ages, health care services will be under increasing demand. High tech products for consumption by firms or households: As firms move up the value chain, and as the health care services sector is developed, a higher demand for high tech products will be generated. Environmental services and equipment for firms: As climate change continues, demand for environmental services and equipment may rise. Next, we turn to the second question. What are industries or niches of comparative advantage? High-tech manufacturing: High tech manufacturing requires skilled labor; further, as China innovates, high tech manufacturing firms may be increasingly home grown. Health care services: Health care services require higher-level training and large amounts of labor to care for an aging population. Environmental services and manufacturing: This industry requires more technical skills, particularly in services, that educated individuals can be trained in. Innovative or customer service oriented retail: Individuals with computer literacy or specialized customer-service skills will be well suited for this industry. Consumer durables manufacturing: This industry requires semi-skilled labor that somewhat less educated workers can be employed in. All of these industries require sourcing of inputs and potentially complex logistics that would benefit from China’s strength in supply chaining. We turn to the final question. The way has already been made for low barriers to manufacturing growth. The industries that may experience the greatest regulatory barriers to growth are those in the service sector. The financial-services sector is highly regulated, and the legal-services sector faces institutional barriers. While doctors currently earn relatively low salaries, the health care industry is a social and strategic priority. In addition, there is a possibility that changes in the hukou system (as laid out in the November 2013 Third Plenary Meeting of the 18th Communist Party Congress) will allow rural residents to access urban health care services, expanding the demand for health care in these areas, as the urbanization process expands. Government policy in the health care industry is, then, currently conducive to growth. All of these industries face potential growth in household, government, or firm demand, as well as comparative advantage. The industries lack significant institutional or regulatory barriers to growth. With supply and demand present and/or growing for these industries, the market is there. Policy that favors these industries should also be a priority. This is because the best plan will likely be one that creates positive externalities in promoting the growth of two or more promising sectors. For example, promotion of the health care services sector along with high tech manufacturing of medical devices would boost both sectors. Fostering a diverse consumer durables manufacturing sector while developing an innovative retail sector will advance both sectors. Although a refocusing of the economy is not an easy task, some of it is already underway. Some corporations have sensed opportunity in the high tech sector, and in domestic consumption. A shift to sectors such as health care and environmental services will respectively occur as the population continues to age and pollution continues to worsen. In the health care industry, demand for health supplements and over-the-counter health treatments are already starting to rise. China’s rebalancing is already in the making and will benefit from additional policy focus. Officials are eager to perpetuate growth; therefore, there is a great deal of potential for expansion in several industries, and the climate of uncertainty may benefit those who have confidence in China’s prospects.